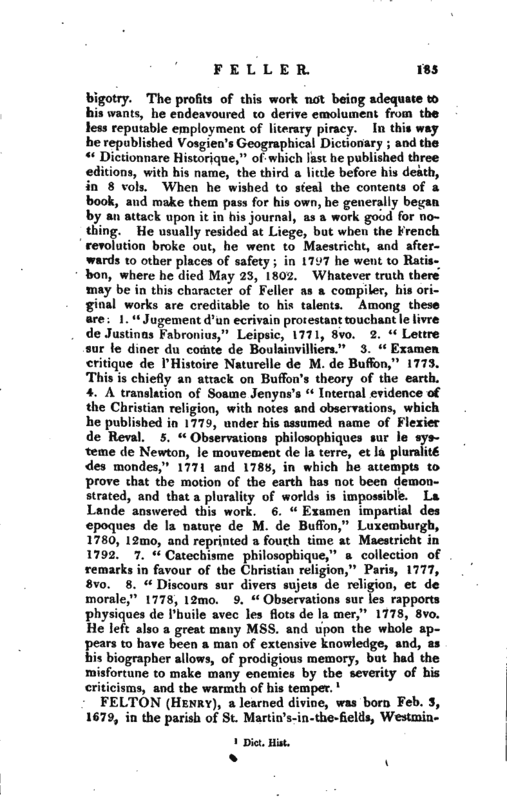 , a learned divine, was born Feb. 3, 1679, in the parish of St. Martin’s-in-the-fields, | Westminster, and was educated first at Cheneys in Buckinghamshire, then at Westminster school under Dr. Busby, and lastly at the Charter-house under Dr. Walker, to whom he was a private pupil. 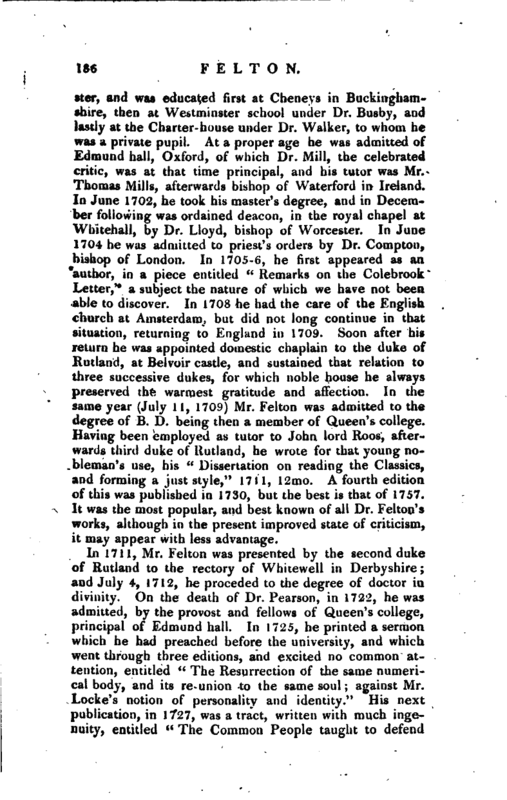 At a proper age he was admitted of Edmund hall, Oxford, of which Dr. Mill, the celebrated critic, was at that time principal, and his tutor was Mr. Thomas Mills, afterwards bishop of Waterford in Ireland. In June 1702, he took his master’s degree, and in December following was ordained deacon, in the royal chapel at Whitehall, by Dr. Lloyd, bishop of Worcester. 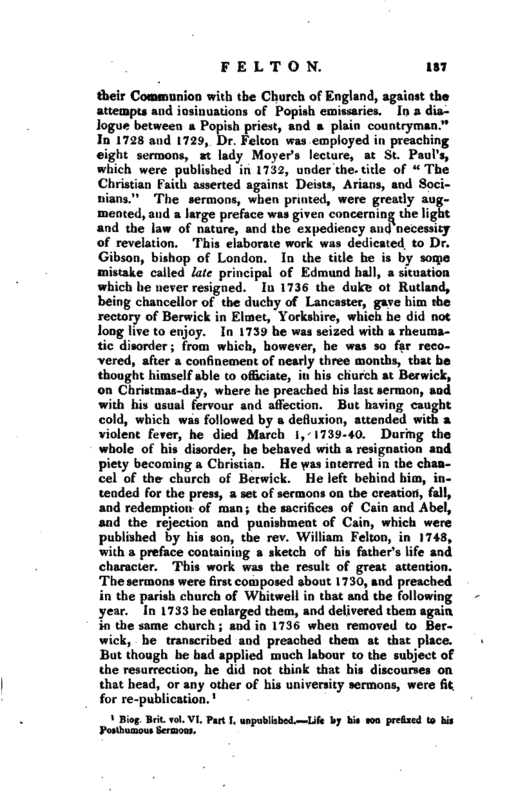 In June 1704 he was admitted to priest’s orders by Dr. Compton, bishop of London. In 1705-6, he first appeared as an author, in a piece entitled “Remarks on the Colebrook Letter/' a subject the nature of which we have not been able to discover. In 1708 he had the care of the English church at Amsterdam, but did not long continue in that situation, returning to England in 1709. Soon after his return he was appointed domestic chaplain to the duke of Rutland, at Belvoir castle, and sustained that relation to three successive dukes, for which noble house he always preserved the warmest gratitude and affection. 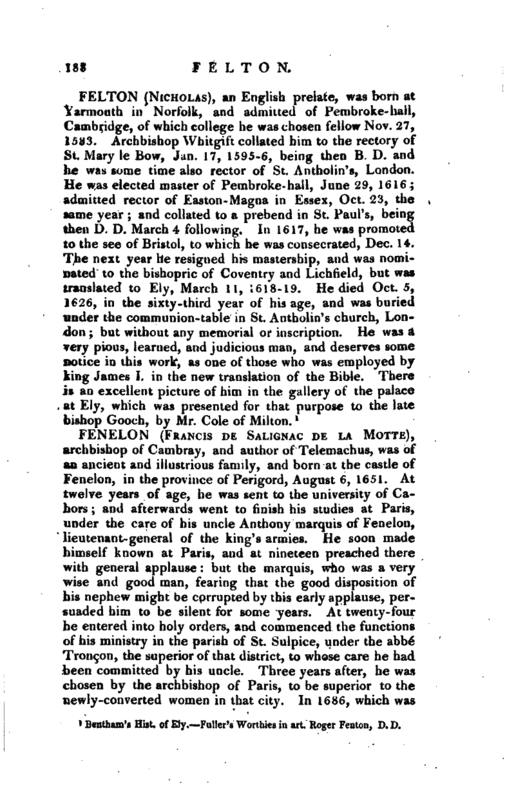 In the same year (July 11, 1709) Mr. Felton was admitted to the degree of B. D. being then a member of Queen’s college. Having been employed as tutor to John lord Roos, afterwards third duke of Rutland, he wrote for that young nobleman’s use, his” Dissertation on reading the Classics, and forming a just style," 1711, 12mo. A fourth edition of this was published in 1730, but the best is that of 1757. It was the most popular, and best known of all Dr. Felton’s works, although in the present improved state of criticism, it may appear with less advantage. 1 Biog. Brit. vol. VI. Part I. unpublished. Life by his son prefixed to his Posthumous Sermons.